On your map screen, tap the green dollar icon on the upper-right corner of the screen. Next, tap the “Earn Cash” icon. The screen will be populated with a list of offers, including downloading a game or app, answering trivia questions, participating in quizzes, playing a web game, solving puzzles and finishing in-game objectives on popular games. 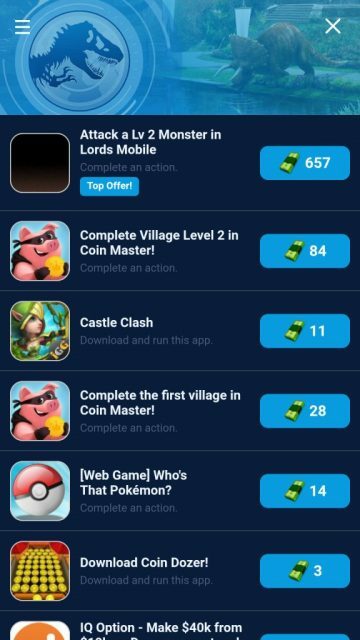 The best offer would be to complete an action in “Lords Mobile” app (you will have to download this app before you can complete an objective) to get more than 500 cash. There are several other offers so keep an eye on them and complete them to get cash. Make sure you complete these tasks via the offers section and not separately. You will receive one free incubator in every 6 hours. You might get some in-game bucks when you open one. Free incubators also contain darts and common DNA. Jurassic World Alive’s supply drops remind us of Pokemon Go’s “Pokestops”. You can locate them in your map. They are tiny blue cubes hoisted on poles. You will have to locate one and move closer to it in the real world to open the supply drop on your map. You may or may not get cash from a supply drop as sometimes there will only be darts and coins inside one. However, there might be some boxes that may contain all three, including cash. You can re-open a supply drop by watching a video and you might find some cash in it. Keep exploring and open cubes in your area to get rewards. Those were a few ways to get cash. Post your comments if you have found more ways to get them. You may also want to check out our creature hunting guide if you want more DNA for unlocking dinosaurs. Where are T-Rex spawns in Jurassic world alive? There are many kinds of dinosaurs you can catch what I want to get is a T-Rex and a hybrid. In Jurassic World Alive, you might get T-Rex DNA from higher arenas. You will receive more DNA from incubators which you get as rewards from a higher arena. There’s also a high chance of acquiring carnivore dino DNAs at night, as they spawn more number of times at night, although can’t say about the T-Rex, but you can still try. Don’t miss events. Some events grant rare dinos if you visit parks. You may not find dinosaurs in a park as the hunting attempts are limited, but you can come back again (as long as the event is active) as they spawn again after some time. Another way to acquire rare dino DNA, including T-Rex DNA, is to open special orange colored incubators near AMC theaters. Yes, you will have to go near an AMC theater to find such special incubators and move closer to one to open it. AMC incubators contain lots of coins, more rare and an epic dinosaur. To get hybrids, you will have to fuse two different dinos. You will have to take DNA from one dinosaur and fuse with the DNA from other Dino to get a hybrid. Make sure you check “possible hybrids” on a dino’s page to know what new dino DNAs you will be getting. You can also tap a dino portrait pic under “possible hybrids” to go to the fusion page. Make sure you have evolved two different dinosaurs to a certain level in order to fuse them together to create a hybrid. They must reach a certain level before you can fuse them. Please note that when you fuse DNAs of two different dinos, what you get is some amount of DNA of the hybrid dinosaur and not the whole dino. So you will have to fuse several times to get all DNAs of a hybrid dinosaur.